5 pages – one page for each troop type, half of which is historical background as to what it did, and the other half is how they work in CoT..
so thats 10-14 pages that covers the main rules n stuff…. then there’s: optional rules(if any) , rules for individual scale, scenarios, glossary, tidbits.. shall we say 10-15 pages, depending on how many scenarios , and how detailed..
so at this stage, the rules will be a minimum 20 pages, max 30 ish…. Recently, Greg and I threw around design ideas for the rules for the French Revolutionary period being contemplated by Eureka. We settled the scale, or at least the scale principals, and agreed on the specific actions that the rules were to model. Scale: figure scale to model company tactics, but sliding to allow lower level light infantry tactics as well. The manoeuvre element is the 8 to 12 model Company. Figures are single based, moving in clumps. Formations such as line, column and square are not relevant as these occur at higher levels of organisation where several companies cooperate. Crudely we may say that the man to model scale is 1:20, but this might best be seen as the top point of a bell curve depending on the specific instance. The specific actions we wish to model would be house to house fighting, bridge assaults (Napoleon at Lodi, for example), light company encounters before the main battle line, task force incursions, and so on. We really have to make it clear that these rules are not for modelling Valmy. There are other rules already available for that. Movement is measured and conventional (curses! No grids!). A single model house represents a single real house. The core mechanic is based on the Cast of Thousands (CoT) system, already employed for many of Anubis/Eureka offerings. This might appear to be a lazy cop-out, but Greg and I did discuss many mechanisms with the aim of finding the one that correctly modelled what we wanted to do. Finally, the new working title for these rules is ‘Terrible Passage’, echoing Napoleon’s observations of his bridge encounter. Next steps: 1) Greg and I need to get a closer understanding of the regional/cultural differences in the protagonists of the period in order to build the factors that will differentiate the sides in the game. 2) We need to do some more reading on the minor tactics of the day and double check that our core mechanism can be extended to cover them without making the rules a joke. 3) As figures become available we must have a sufficient and growing quantity painted up to rigorously test the system. In the meantime Greg and I have figures we can push around. But we want to get the real thing, with camera in hand, so that we can simulataneously capture scenarios for illustrative purposes in the rules. Here is a list of the nations, factions and republics (newly created) that took part in the French Revolutionary wars. The lists just go to Wikipedia at this stage. 1792 France declares war on Austria. Austria allies with Prussia, Hess, Piedmont and French émigrés. Combined allied army invades France. Battle of Valmy results in French victory. France conquers Savoy and Nice. French raid into Germany captures Maintz and reaches Frankfort. 1793 Formation of the ‘First Coalition’ against France. France declares war of Great Britain and the Netherlands. France invades Netherlands. Austrians win in Belgium in battles at Aix-la-Chapelle and Liege. 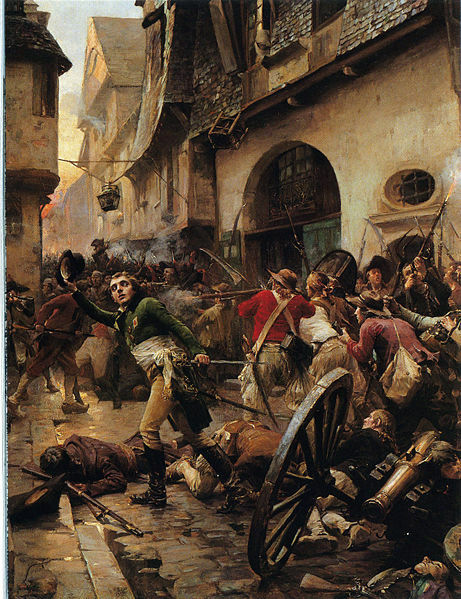 Rebellion in Lyon and Marseilles. The Vendée uprising. Spanish armies invade France, as do Sardinian and Austrian. Counter revolutionary forces hand over the port of Toulon to the British. 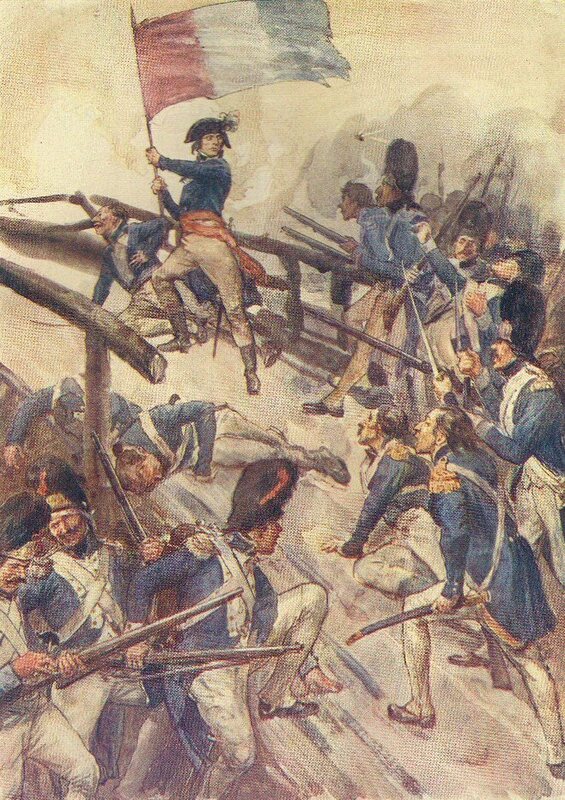 British defeated at Hondschoote. 1794 Action against the Spanish. Action against the Austrians in Belgium. French armies drive Austrians, British and Dutch beyond the Rhine. Prussian counter attack is largely ineffective. 1795 France occupies the Netherlands, which joins the revolution and becomes the Batavian Republic. Prussia leaves the First Coalition. French continue into Spain, who make peace. British landing at Quiberon to support counter revolutionaries fails. 1796 Only Great Britain and Austria remain as part of the First Coalition. Napoleon takes over command of the army of Italy, where he achieves a number of stunning victories. French cross the Rhine for a number of encounters with Austrian forces. 1797 Napoleon continues his success in Italy. Austria attempts to assist in Italy but are defeated. French pushes across the Rhine cause Austria to sue for peace. Only Britain remains opposed to the French Republic. First Coalition ends. 1798 French invade Egypt as a way to disrupt British Mediterranean trade, led by Napoleon. French invade Switzerland and establish the Helvetic Republic. France tries to invade Ireland but fail. France occupies Rome and establishing Roman Republic. Revolt in Belgium against French rule. At the end of the year the Second Coalition is formed of Austria, Great Britain, Russia, French Royalists, Portugal, Naples and Sicily, and the Ottoman Empire. 1799 Napoleon abandons army in Egypt to prop up rule at home. British and Russians invade Batavian Republic, resulting in failure. Much fighting in Italy. By the end of the year French troops had almost been totally driven out. More fighting around the Rhine against Austria, who were successful in expelling the French back across the Rhine. Battles in Switzerland against Austria. Russia leaves Second Coalition. 1800 Austrian attacks in Italy. Napoleon takes command and leads a strategic outflanking action. Austrians leave Italy. Another Rhine crossing into Germany. Austrians again defeated, leading them to sue for peace. Battles in Egypt. 1801 Exhausted French in Egypt surrender. Second Coalition collapses without Austria. Most action is at sea against the British. Treaty of Amiens in 1802 ends war between Great Britain and France. Some semblance of peace at the macro scale exists until 1804, when Prime Minister Pitt of Great Britain forges the Third Coalition and, with napoleon now Emperor, the Revolutionary Wars are over and the Napoleonic Wars begin. The following is a list of imaginative weapons described in science fiction writing during or before the period of our Jurassic Reich game. These weapons must be accounted for in our rules, and modelled to follow the available descriptions. For example, the word Laser was not coined until the 60’s. What we had in the 30’s was a ‘raygun’, and the rays had lots of different effects. Similarly, the word ‘gauss’ is a very modern one to describe projecting a bullet through electromagnetic force instead of explosive combustion. At the time it would have been called an Electric Gun – though not to be confused with the Electric Rifle, an entirely different beast designed by the heroic character of the age, Tom Swift. This list is the starting point of our investigations into this period of technological fantasy. Blaster – a deadly energy weapon. Electrify the Rail – repel boarders! Pentavalent Nitrogen – most powerful chemical explosive. Here are some more proposals for Jurassic Reich. Please confirm or refute them point by point. 1) Space travel to the planets by rocket is commonplace and has been steadily improving since the days of Verne. 2) People can freely expect to travel to the planets of the solar system and do so with the same ease and frequency as they historically travelled on ocean liners. 3) Travel times between the planets is comparable to oceanic travel. So we are talking hours to the Moon, a few days to the closest planets, and a few weeks to the outer planets. Must check for time-dilation effects here: Einstein had published by this time. 4) Only the planets known in the 1930’s exist in the game (Pluto was discovered in 1930 – this would make it a mystery world). All planets are habitable. 5) Space is filled with air, because that is what everyone at the time believed. So it is possible to ‘step out on deck’ when on a space voyage. This is problematic with regard to implied speeds because of Aerodynamics and friction effects (both of which were well understood at the time. The speed of sound was known and believed to be unbreakable. ) . This clause alone may give us a lot of trouble. 6) The Great War (1914 – 1918 ) occured for much the same reasons, and had much the same result, except that the conflict spread through the planetary colonies as well. As a result of the crushing economic effects of this war, the Great Depression has still occured, and the revolutions in Germany and Russia have still occured, all with the same effects as those of genuine history. 7) Stargates, or Himmeltors, have only very recently been discovered, offering instant travel between locations on Earth and the planets. This is a strategic enabler, shortcutting travel times and threatening to upset the balance of power. Nazi Germany, particularly, is quick to recognise the ability to lauch surprise attacks. 8.) With the recognition that ancient or mysterious artefacts are real and can directly impact the political life of mankind, the race is on to secure these artefacts, or at least to prevent them from falling into the hands of one’s ideological enemies. 9) The world of Jurassic Reich looks very much like the world that the people of the thirties dreamed of. This setting is their fantasy come true. I propose that the core themes of this setting are to be found in the art and stories of or directly inspired by the 1920’s and 1930’s.